Emergency lock and key problems happen often. The point is to have them addressed fast. And that’s possible with our Calgary 24/7 locksmith company. Are you locked out? Need help after a burglary? Seeking a pro to rekey locks urgently? Don’t lose our phone number. Our expertise in all types of locks and our commitment to serving quickly is a powerful combination much appreciated in times of urgent need. Call us with your troubles and experience firsthand the value of relying on Calgary Locksmiths that can help rapidly and address any problem in an effective manner. We will send you an emergency locksmith 24/7 whether or not your security is already compromised. If it is, it means you are already dealing with the aftermath of a break-in or a broken key or a lockout. And in this situation, we will send you a pro to restore damage and the security of your property in just minutes. If the security is not yet compromised, simply turn to us with the assurance that a pro will provide 24 hour locksmith service in such a prompt way that you won’t have to worry about anything. So if your keys are stolen or simply lost, don’t take risks. Call us right away for an emergency lock rekey service. If the key is hard to turn in the door lock lately and you fear it might break, don’t force it. Call us instead. It’s best to have a pro to make new keys for you instead of struggling to urgently find a pro for a house lockout service. But let us assure you that our company will be equally responsive and helpful in both cases. We are actually at your service every time you are in an office, home, or car lockout. A pro is dispatched to unlock doors but also open jammed safes, extract broken keys, fix locks, program transponder car keys, and do any repair that will bring your life back to normal while it will restore the security of your car, house, or company. We are a 24 hour locksmith company because we understand that even small lock & key problems can easily turn into major security concerns and can be very frightening. Relax knowing we are here for you. 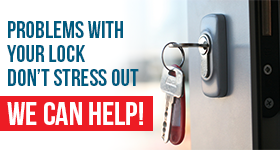 No matter what happens, call us and we will send you a 24/7 locksmith in Calgary.